The more I talk to people about going on pilgrimage to Santiago de Compostela, the more interesting questions I’m getting. Talking to people about walking the Camino is a little like test prep. I’m realizing that many of the questions I asked myself when first starting to think about becoming a pilgrim are things that I almost never think about anymore. It’s been good to get reacquainted with the basics, since they’re going to be of utmost importance when it’s just me and a very long stretch of road. Below are a few of my favorite questions and answers thus far. I’ll be writing down more questions as they’re thrown my way, and answering them on here, so stay tuned! In the mean time, if you haven’t seen my GoFundMe page yet, please check it out. I really appreciate your help, and you can get a free book out of the deal. 1) How long is the Camino? There are many routes a pilgrim can take to reach Santiago de Compostela. Arguably, any route a pilgrim takes is his or her “Camino”. It’s also common spiritual practice to consider the pilgrimage to have started the moment the pilgrim steps out of their home. In fact, some particularly devout people walk all the way from their front door to Santiago de Compostela, which can take many months. The Camino Frances is the most popular route today, and many pilgrims consider the route to start at St. Jean Pied de Port in France. The distance from SJPP to Santiago de Compostela is around 790km (reports vary), or 490 miles. The various routes you can take to get to Santiago de Compostela. If you’re interested in finding out more about the individual routes, visit Camino Ways. 2) Man, that’s a really long way! Do you get some kind of prize at the end? Spiritually speaking, the journey is the “prize”. However, for those who need a physical gold star to feel like the trip has been worthwhile, there’s also the Compostela, a certificate that says the pilgrim has walked, biked, or rode a horse for at least the last 100km of the Camino. The Compostela. Click through to read pilgrim blogger Erin’s Camino packing list at La Tortuga Viajera. 3) How do they know you’re telling the truth about walking the last 100km? 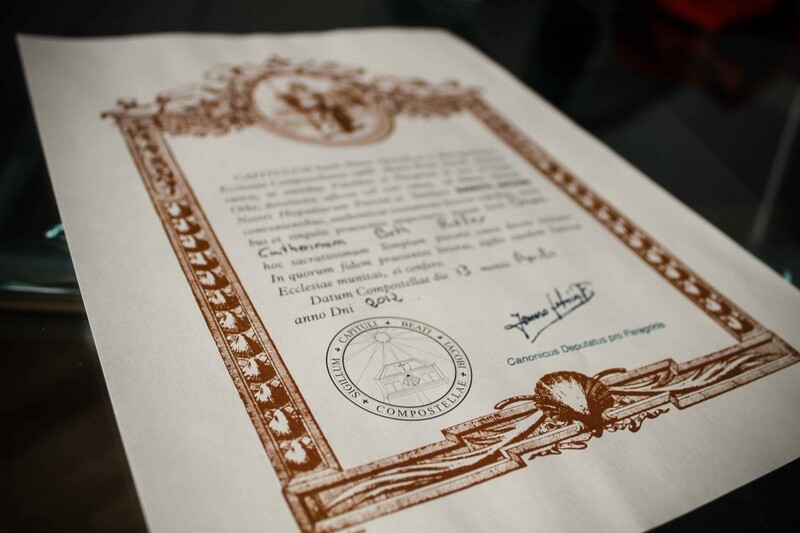 One of the most important things a pilgrim carries with them on the Camino is a pilgrim’s credencial. 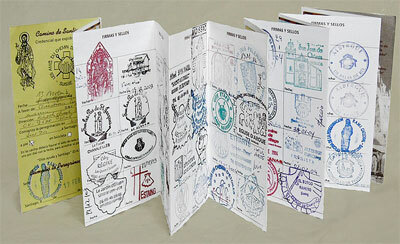 It’s a little booklet that works basically like a passport. Pilgrims get one from their local pilgrim organization (mine came from American Pilgrims on the Camino), but you can get one in SJPP or at various official spots along the route. It’s very important to keep the credencial safe and sound, because the stamps prove the distance you’ve traveled. You get the credencial stamped at least once a day before you hit the last 100km of the Camino, and twice a day thereafter until you hit Santiago de Compostela. You can have it stamped at your alburgue when you stop for the night, and various cathedrals, cafes, and popular pilgrim tourism spots also have stamps. I’ve even read that some people end up getting two credencials so they can get stamps at more than one place a day for the entire trip. A pilgrim’s credencial (credential) filled with sellos (stamps). For more on this document, click through to visit Camino Buddies. 4) Will you be camping out? Where will you sleep? It turns out that a lot of people equate any long hiking trip with being completely removed from modern life. This is not the case, and I won’t be camping at all on this trip. Over the years since the Camino grew to popularity in the Middle Ages, then again in modern times, towns and villages have sprung up all along the path. There are plenty of modern conveniences available for pilgrims, including hotels, bed and breakfasts, guest houses, and alburgues, which are a lot like hostels. Each place I’ll stop for the night will have at least one, but probably a few, alburgues. Some of these are run by municipalities, some by pilgrim organizations, and some by private owners. The prices vary, but are generally quite affordable. Paying for a bed for the night will typically get me space on a bunk bed in a room of 6 to 8 people (sometimes in a dorm-style room with many people). We’ll have access to modern bathrooms with showers, as well as a shared kitchen. I’m also hoping to get a private room at a hotel at least once or twice during the trip, to have one good night in a comfy bed and some quiet time to recharge. Alburgue in Roncesvalles, from The Yellow Arrow, a really great blog about one woman’s journey along the Camino. 5) What will you eat? Spanish food. Lots and lots of Spanish food (here’s a great breakdown of some of the regional cuisines I’ll get to try). During the day I plan to try to keep to simple, healthy meals on a tight budget. I’ll carry boiled eggs, cured meats, and fruits and veggies. For dinner, I’ll either cook with other pilgrims or buy something. Some alburgues offer dinner in the price of getting a bed for the night, and lots of restaurants and cafes offer a specially priced pilgrim’s meal. From all accounts, this includes multiple courses and wine, often at around 10 euros. I love trying out the cuisine when I’m in other parts of the world, so while I intend to stay pretty healthy, I’ll definitely be trying as many new flavors as possible. 6) What are you carrying with you? I haven’t decided yet, but the basic guideline is to carry no more than 10% of your weight, which includes the weight of your bag. Most people take two changes of clothes (one to wear, one in the bag), hiking shoes and socks, a pair of shoes to change into after walking each day, flip flops for the shower, a sleeping bag or sheet (depending on time of year), a towel, toiletries and medications, and whatever assorted electronics they need. Each pilgrim’s list is personalized, and everyone seems to have an opinion on what’s necessary and what’s extraneous. I’ve talked to women who wouldn’t dream of leaving home without some mascara and lip gloss, and others who didn’t even shave their armpits for the trip because the razor would have added too much weight. Some people have no problem packing a DSLR, while others are happy with taking pics on their cell phone. Still others don’t bring any electronics at all, saying that it’s not genuine to the spirit of the Camino. My bag is 36 liters, and weighs around 3 lbs. My sleeping bag weighs another 1.5 lbs. I’m aiming for 15 lbs, max, though I know I can comfortably carry as much as 18 lbs. This gives me between 10 and 13.5 lbs to work with. I’ll be keeping my clothes very lightweight – athletic leggings instead of pants, trail runners instead of boots, the bare minimum in my toiletry bag – but I’m also going to be carrying a camera, my cell phone, and an iPad mini with a keyboard. I want to be able to write and photograph from the road, so I’ve made the decision to cull clothing options in exchange for keeping electronics. It’s definitely a far cry from those ancient pilgrims who left home with just the shirt on their backs. 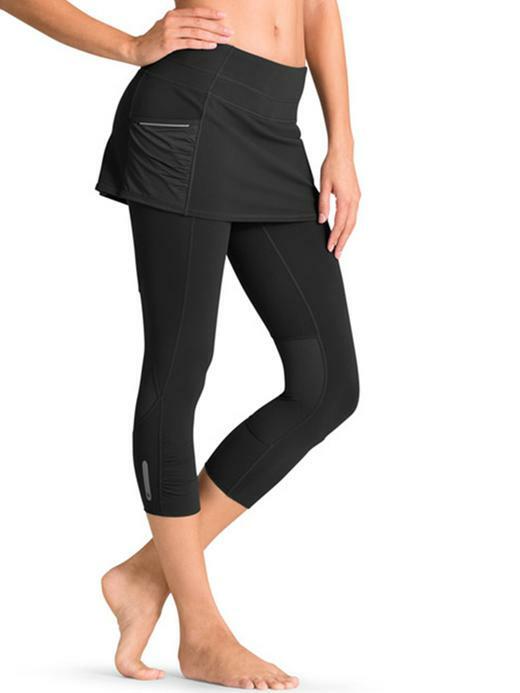 Just found these used Athleta 2 in 1 capris on Ebay. I wanted to wear leggings, but also show a little less of my shape. I’ve heard good things, so crossing my fingers these will work! 7. Are you going with someone? Short answer: no. Medium answer: not exactly. Long answer: not at first, but I expect to make friends pretty quickly. The Camino experience is an eye-opener for a lot of people, and I fully expect that it will work its magic on me, as well. There’s this great piece of advice that gets passed down in all of the books and forums out there: walk at your own pace. It might be the best advice I’ve ever read, even though I haven’t stepped foot on The Way yet. It’s certainly been helping me, spiritually speaking, in my everyday experiences for a couple of years now. In physical terms, knowing your own pace is something every long distance runner understands. It’s bad news to start out hot right out of the gate. You’ll wear yourself out when all of the other people are just starting to find their stride and pull ahead. When running or walking, people who start with a loved one often find that their paces naturally differ. A 5’3″ person and a 6’1″ person are not going to have the same stride. The short person will have to speed up, or the tall person will have to slow down. When you’re walking 500 miles, going too fast day after day leads to physical injuries. Going too slowly day after day can lead to boredom, and maybe even a grudge. This being said, plenty of people with different paces find a way to walk this thing together, but many find it easiest to take off, walk their own pace, and reconnect at the end of the day at the next alburgue. What most people seem to do on the Camino is start walking and see who they run into. The stages of the trail are similar. Most of the time if you start walking in SJPP, you’ll stop walking that night in either Orisson or Roncesvalles. When you leave Roncesvalles in the morning, you’ll most likely walk to Zubiri. Over time, you’ll end up leaving and arriving in time with the same group of pilgrims, and many people end up cultivating what they call a “Camino Family” – a group of pilgrims that end up walking together, sharing stories, sharing meals, and generally looking out for each other. I will meet people from all over the world, and probably have at least a couple of new, lifelong friends when I get back from Spain. So no, I’m not leaving the US with anyone, and I’m not starting my Camino with anyone, but I’ll almost definitely be finishing up in Santiago de Compostela with my Camino family. Click through to read a fabulous post all about Camino Families over at See You Soon Mom. A keyboard sounds like quite an awkward thing to have in the backpack. It would be good if you could get one that you pulled open inspector gadget style. Or a roll up one, which actually does exist. I can imagine they’d be useless though. I have an iPad case with the keyboard built in. It adds almost no weight to the overall iPad, and serves as extra protection. Yep that makes a lot more sense. Hi Anna! Thanks for the link t our blog! To ‘have’ a Camino Family was one of the most loving experiences I had in the Camino. We became friends to life. Even now, 2 years later, I am in France, in the house of one of my ‘Camino sister’.